oops, forgot to add also, when i messaged some people today, it kicked it back to me saying this person cannot accept any new messages. I have never gotten that before, what is the reason do you suspect for that? Somebody has their account set to not accept PMs. Or they have the maximum amount of stored messages in their PM box and they need to clean it out. But was wondering if it was possible to read the threads from last post made to first post made. Not 1st post made to last. Can you highlight the forum titles or something to make them more visiable? Unfortunately, I don't see any way to reverse the display order of a thread. The only solution I have is go to the end of the thread and read backwards. You can pick which forums to want to read and filter out everything else. Click the View New Content button. Go to the bottom of the left-hand nav bar and click "Filter by forum." You can pick and choose which folders you want to see posts from. On the PC, hold down the control key and click on the forums you want to see. I don't know how to do that on a Mac. I find the white background just a bit too bright for my aging eyes. Am still checking out things and getting used to the new look. Good news: We're working on changing the color scheme around a bit. The white doesn't bother me much when viewing on my laptop, but it does cause eye strain for me on the iPad. That's one thing we're DEFINITELY going to adjust: the huge amount of white space in a post. It may still be a huge amount of space, but will be a softer very light color that won't glare so much. Now today there are no "stars" by the threads that I have replied in. Also not crazy that when you view someone's profile it lists everyone that viewed it and when they viewed it. Are you sure you were logged in? I don't know why else the stars wouldn't show. The last 5 visitors showing on a profile is a setting that each member can adjust for their own profile. If you don't want to show the last 5 visitors to your profile, there's a box you can uncheck in your settings. The other thing I miss, like Deb a post back, is the Stars next to the threads I've posted in. That was a nice easy way to indicate which threads I'm posting in when I'm just browsing through the "New Content" screens. Where is that you all are not seeing the stars? I seem them in the thread list after I've clicked View New Content. I have a feature that lets me "log in" as a member so I can see what they're seeing. Let me know if you'd like me to try that. 1. Make sure you're logged and haven't been logged out for a period of inactivity. 2. Make sure you really have posted in those threads. Somebody didn't see stars the other day, but didn't realize she was logged out at the time. 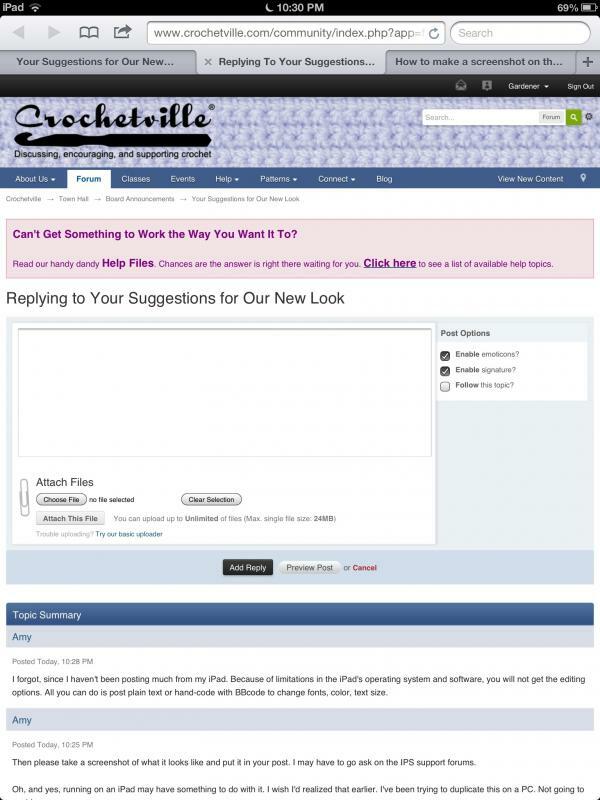 The print is so dim and fuzzy I can't read what others have said, but I think Crochetville was fine the way it was. (just as CPC was ) I don't know why this pale light blue has become so popular. Everything is a blurr to my eyes, and.since the print is so bad, I can't see how to move around to find anything. The colors seem to be standard on many websites. Part of the move to very pale fonts is to help make sure that the actual content is whats first and foremost, prominent, on a site. The colors here are just the default forum software colors. We'll be tweaking things to help those who are having diffculty seeing the pale blue-gray. I am no longer seeing a way to post smilies, nor a way to change font color or size. Yesterday morning I was able to use those features, but they had disappeared by yesterday evening and are still gone. I've tried using both the quick reply box as well as the "reply to this topic" at the top. Are you just not seeing the row or emoticons at the bottom of the post? Click the smilie in the post formatting toolbar. The little row of smilies at the bottom will show up.Then you can click the "Show All" link to get a pop up window you can scroll through that also gives the code for the smilies and shows them at their real size. Amy, I don't see a post formatting toolbar anymore. I saw it yesterday morning but it was gone when I checked back in yesterday evening. I tried logging out and logging back in, but that didn't help. Try clearing your browser's cookies and cache. If that doesn't work, tell me what browser (and version) and operating system (and version) you're using. I think I figured out what might be the problem. Does your post reply box look like this photo? If so, do what the photo says. Click on the photo to see it bigger so you can read it. Could it be because I am opting from an iPad? Although I posted from my iPad yesterday as well, and it worked yesterday. I tried posting from my iPad mini and I have the same issue there. I rarely use that device to access the Internet. I did clear cookies and cache on the iPad, but there is no difference. I'm using a Firefox browser on an iPad currently, but tomorrow I will try from my laptop. No, there isn't a little arrow in my reply box. Then please take a screenshot of what it looks like and put it in your post. I may have to go ask on the IPS support forums. Oh, and yes, running on an iPad may have something to do with it. I wish I'd realized that earlier. I've been trying to duplicate this on a PC. Not going to work! I forgot, since I haven't been posting much from my iPad. Because of limitations in the iPad's operating system and software, you will not get the editing options. All you can do is post plain text or hand-code with BBcode to change fonts, color, text size. That's just what the posting box looks like on my iPad. Donna and I researched this for someone else the other day, and the answer just slipped my mind. The iPad is incapable of displaying the formatting options toolbar. If you used the toolbar the other day, you must have done so from a Mac or PC, because you just can't do it from the iPad. Which is really frustrating, because I normally use my iPad to post most of the time. It's just that everything I'm having to do to help solve people's issues and questions is easier done on the PC. But before long I'll be back to posting on the iPad and wishing I had the full formatting toolbar to use. Thanks Amy, I really don't remember using my laptop, but I guess I must have, I use my iPad most of the time. Glad to read that the white background is going to be changed to a softer color! I second that. It's getting really hard on the old eyes. I don't have an Ipad or any or those other fancy techno things, so I just have to worry about learning everything new here on my pc and so far I'm doing ok. I sure will be happy to have softer colors to look at though. For me, the Go to Next Unread Post option is wonky. I'm logged in (Mac on Safari browser), I click in the upper right to see the unread content. Some threads I know I've been to before do not display the unread post option at all, and those that do will sometimes take me to the right post, other times, will take me close but not where I was. With 20 posts per page, it's a lot of wasted time scrolling around to find the spot where I left off to start reading the new content in the thread again. This is probably the most annoying thing for me since the format change because it's major searching/scrolling for every thread I'm trying to read. When I am viewing a thread or replying to one, I liked it when the green light was on and you knew that the person was online. I don't see that feature - am I missing something? If you haven't already found it, if you hover over a person's name (not avatar), it displays a green 'online' / grey 'offline' notice. Interestingly, you are online as I'm posting this and I can also see what thread you are reading right now!! Yes, I did notice that, but I liked it the old way. So when I was scrolling down a page, I could automatically see who was online. In the old version of C'Ville, we used to be able to see what other members were viewing and then, I think, they shut it off. BTW, I just noticed that our locations have been added back in, yay! I appreciate all the efforts Amy and Donna have gone thru to get us up and running again and trying to make our new 'ville feel like home. I'm going to have to let Donna help you on this one, since you're on a Mac. I haven't experienced this with Firefox on a PC, so I don't think I'll be able to help you. I am trying to make the Online/Offline button appear under everyone's avatars. I've been successful in getting the button to appear in that location, but I haven't been able to get it to work right yet. I've got a request in for somebody to tell me what other part of the code I need to make sure to grab. 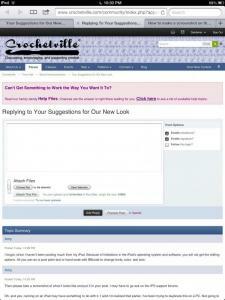 However, we prefer that people be able to browse the forum in privacy without other members knowing where they are. I thought I had things set right for that, but it appears they are not. So don't be surprised when that feature disappears! ETA. It posted as one long paragraph instead of two sep paragraphs but when I went in to add this ETA sentence the paragraphs separated themselves. ???.. It's probably something with the way the iPad software interacts with the post editor software used by the forum software. I'm not sure we can do anything about it. I'm posting with an iPad now to see what happens. That's really strange. The only solution I have now is to edit the post right after posting so the paragraphs get added correctly. Maybe that will be fixed with the next update of either IPS or the iPad's iOS.